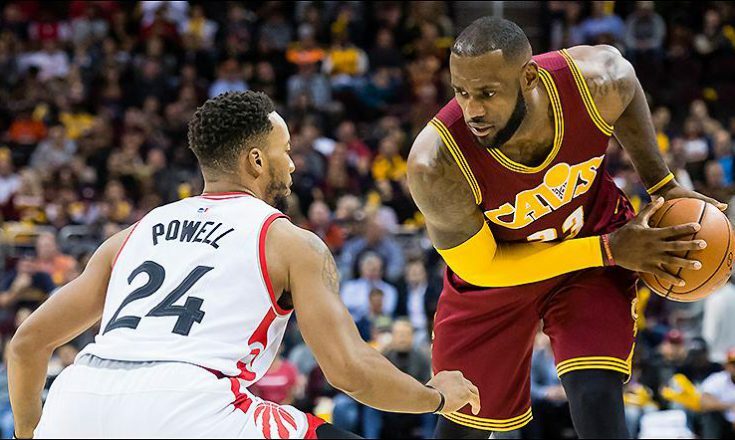 The NBA has the star-packed Finals that everyone around the league has been waiting for, and it will get underway on Thursday. Some of the faces have changed since last season, and the Warriors are still heavy favorites after adding Kevin Durant to their team that had the Cavs dead-to-rights before letting them dig out of a 3-1 hole. The Warriors are out for revenge, and LeBron gearing up for another epic upset t try to even up his Finals record at 4-4. I’m going to take a look at the key matchups in the series and decide who has the advantage at each position. Steph Curry comes into these NBA Finals as the much more respected and decorated point guard. He won the last two regular season MVP’s (the last one unanimously) and is viewed by many as the best shooter in the NBA. He has the ability to get hot and light up the scoreboard from way beyond the arc, but he has struggled with playing up to his potential in the last two Finals. Last season, he was hampered by an injury, but Kyrie got the better of him by putting up a few monster games to close out the series and by hitting one of the most memorable three’s in NBA history to close out Game 7 last season. He also had an incredible run in Game 4 of the Eastern Conference Finals this year when the Cavs really needed him to step up. Both players have their deficiencies on the defensive end of the floor. 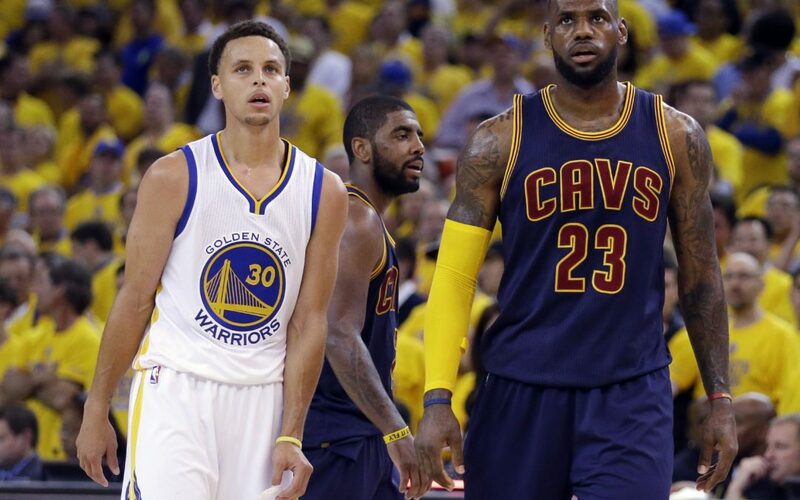 The Cavs will probably try to exploit Curry by using LeBron and Kyrie in pick-and-roll situations to isolate him and cause him to try to make quick decisions, while Golden State will probably try to wear Irving down by running him of screens and try to get him in iso situations on defense as well. Both of these guys have a lot to prove, and this should be a great matchup to watch throughout the series. Curry has been a better overall player throughout the last few seasons, but he’ll have to prove it on the big stage. Klay Thompson is another one of the best shooters in the league and can be deadly when he gets on a hot streak. He hasn’t been talked about as much this season because he has seen a decrease in touches and shots as a result of Kevin Durant being added to the mix. JR Smith did a great job of sticking to Thompson in last season’s championship round and caused him to have some very inefficient nights from the floor, but Thompson has the ability to get free and take off at any moment. Smith has not shown much on the offensive side of the ball since coming back from a broken hand earlier in the season. He still has his normal JR hot streaks and does not have a conscience when it comes to lifting shots, but he has not taken many shots in the playoffs so far. He really hasn’t been involved in the offense enough to really heat up and has been a non-factor on the offensive end. He will definitely make things difficult for Thompson, but I don’t see there being any way he outscores him. Kevin Durant joined the Golden State Warriors this offseason for two reasons: He couldn’t get past them in the West, and he thought they gave him the best chance to beat LeBron. LeBron has owned Durant throughout his career and has an 18-5 record against him. It’s not like Durant doesn’t play well against LeBron because he has very solid numbers in their matchups, but he just can’t seem to beat him. Some of that has to be getting to Durant because he keeps hearing all the time about how LeBron always gets the better of him. LeBron is also playing some of the best basketball of his career right now and is setting out to prove to everyone that his is still the top dog. He has consistently shown the world that he was the best player in the Finals the last two seasons. He produced two wins in the 2015 Finals with a far inferior team, and last season, he led all players on both teams in points, rebounds, assists, steals, and blocks. It doesn’t get much more dominating than that. For a long time, most experts said Durant would eventually take over for LeBron as best player in the league, and this series is his chance to prove them right. Kevin Love has played the role of “fall guy” for the Cavs the last few seasons. He has long been thought of as the member of the big three that was not living up to his potential. Love seems to have found his groove throughout this year’s postseason and is playing his best basketball as a Cav. He has been scoring the ball very efficiently, shooting well from three-point range, and putting up big numbers on the glass. His defense has even improved. Draymond Green is a very dynamic player in his own right. He may be one of the most versatile players in the league. He can guard several positions very effectively and is considered to be one of the best defenders in the league. He doesn’t score a ton, but he can shoot from long range and is a great passer and rebounder. He plays with great passion and has let it be known that beating the Cavs has been a driving force for him since last year’s Finals. His temper can sometimes get the best of him, and it cost him a very pivotal Game 5 last season. However, he will be putting all of his energy into trying to defeat what he considers to be an inferior squad this time around. Zaza Pachulia is taking over for Andrew Bogut in the Warriors’ starting five. Pachulia is not known for his scoring but rebounds well tries to use his hustle as an irritant to opposing players. He is not known for defending the lane the same way that Bogut did. Bogut made things difficult for Kyrie and LeBron in the paint and it’s no secret that his loss to injury had a major impact on the last few games of last season’s Finals. Pachulia has filled in admirably for Bogut at a bargain price, but he will not be able to effect the series with way Bogut did. He is also coming off of an injury, so it remains to be seen how effective he will be. Tristan Thompson has been a thorn in the Warriors’ side the last couple of seasons. His relentless pursuit of rebounds (especially on the offensive end) and ability to switch onto the Warriors’ guards on defense is the major reason he was able to get a big contract extension with the Cavs a year ago. He and Matthew Dellavedova were the key pieces who helped LeBron keep the Cavs competitive in the 2015 Finals after Kyrie went down with the fractured knee. 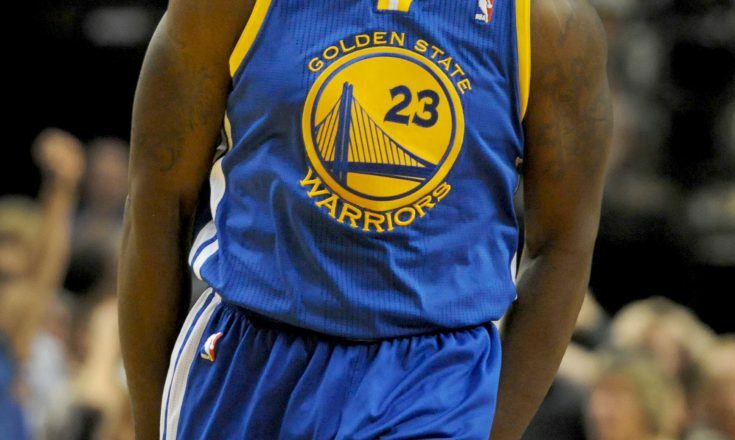 He is the perfect big man to help combat the Warriors’ small-ball lineups. His foul shooting has been an issue that the Warriors may try to exploit, but even that has improved lately. Shaun Livingston and Andre Iguodala have caused many problems for the Cavs in each of the last two Finals. Iguodala won the Finals MVP award in 2015 for the way he played off the Warriors’ bench. Having the former all-star to score and defend opposing wings off the bench has been a big advantage for the Warriors, and it will probably continue to be an obstacle for the Cavs. Livingston has also been a matchup nightmare because of his length. At 6’7, he towers over most opposing point guards and can get his midrange jumper almost anytime he wants or even get off contested looks deep in the paint. He has also been a huge factor in the Warriors’ success against the Cavs. The Warriors depth has definitely gotten thinner since adding Durant, but rotations aren’t as deep in the Finals. The Cavs probably have a deeper overall bench, but it doesn’t matter because they haven’t been going more than a few deep. Shumpert’s ability to guard will definitely be a key off the bench, but his offensive game is lacking. He will be able to give Smith some breathers, but I don’t expect him to score many points or wear anyone out on that end of the floor. Korver is a tremendous sharpshooter, but he hasn’t been much of a factor in the playoffs so far. He also may struggle some on defense trying to keep up with the Warriors’ offensive pace. Deron Williams does a solid job running with the second unit and initiating the offense when needed, but he is definitely getting older and slower on defense. I’m sure both sides will have some unexpected guys step up at different times, but I think this series will mostly be decided by the stars. I know the Cavs starters will be playing huge minutes for sure. I know Vegas and the experts are making the Warriors the huge favorites again, and why shouldn’t they? The Warriors are the better team on paper, and they looked to have the series wrapped up easily last year before giving up a 3-1 lead. They added one of the NBA’s top 5 players in the offseason and have all of their best players healthy this time around. They definitely have a good chance to win the third round of this matchup, but I can’t help but follow my heart and the best player in the game. For my entire life, I watched Cleveland sports with the thought in the back of my mind that my team would find a way to lose. In third grade, I remember telling my dad that Jose Mesa was going to blow the lead in Game 7 of the 1997 World Series before it happened. Last year, that all changed. I watched LeBron James play unbelieveable basketball, and bring my city its first professional sports championship since 1964. I have seen him do the impossible, and I believe this team can do it again. 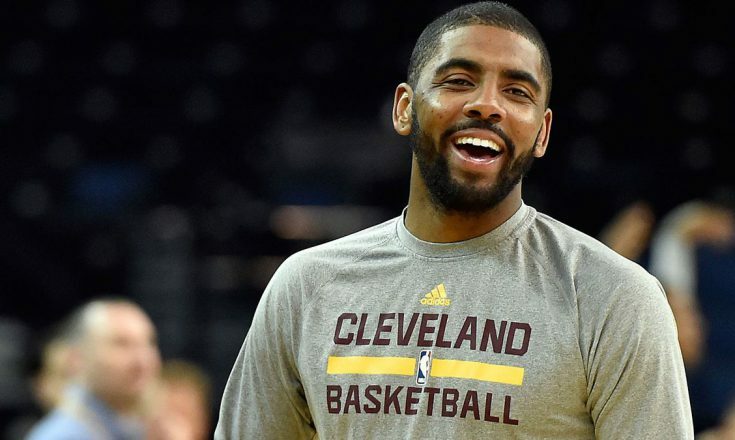 After Kyrie Irving hit his epic three-pointer last year, I looked at my wife and said, “We’re actually gonna win.” With LeBron still playing his best playoff basketball, Kyrie clicking at the right time, and Kevin Love playing at the top of his game, it’s time to see if the Cavs can beat a favored opponent back-to-back years. Our mindset has shifted in Cleveland, and now we believe we can be champions again.